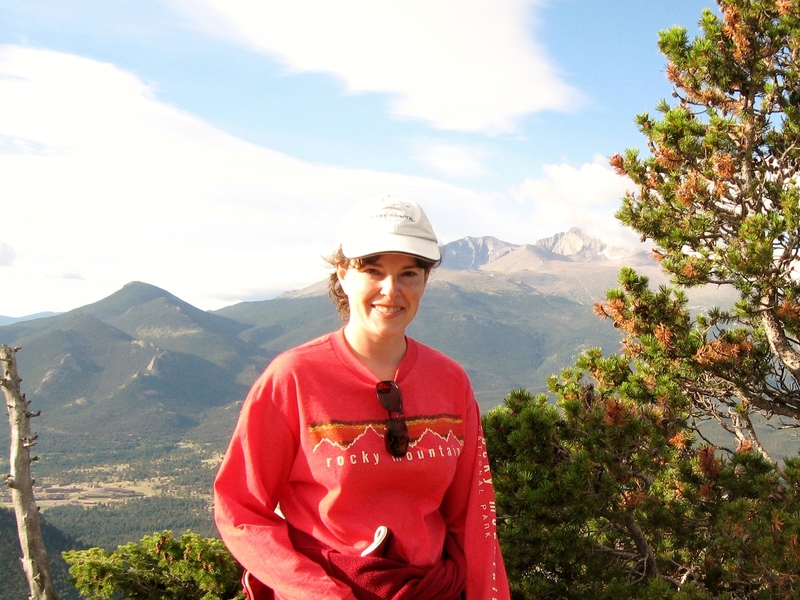 We travel to Colorado each summer, and drive on by Denver while heading straight for the mountains. This last fall, the school schedule gave us a couple of days off in October, and we decided to fly to Denver and explore the city. 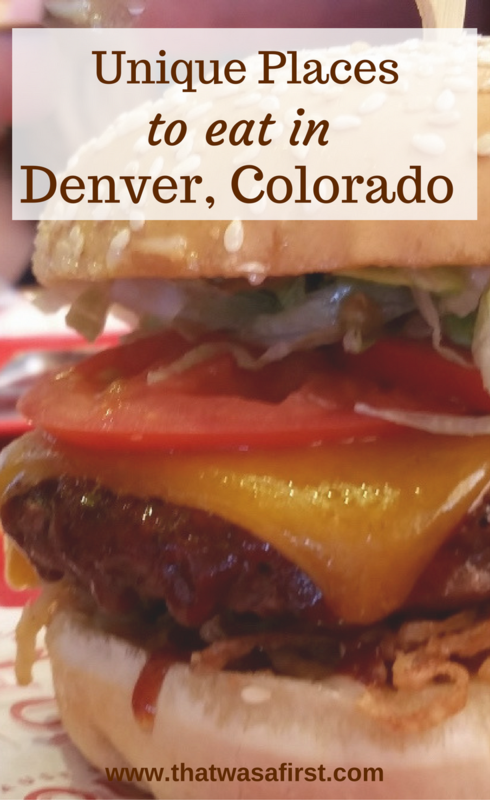 Since this was our first time in Denver, I wanted to find some fun places for us to eat. We got lucky in Denver and found some pretty unique places to go, and had some fantastic meals. Are you wondering where to eat in Denver? My 11 year old loves biscuits and my mom will always go for a good plate of biscuits and gravy. 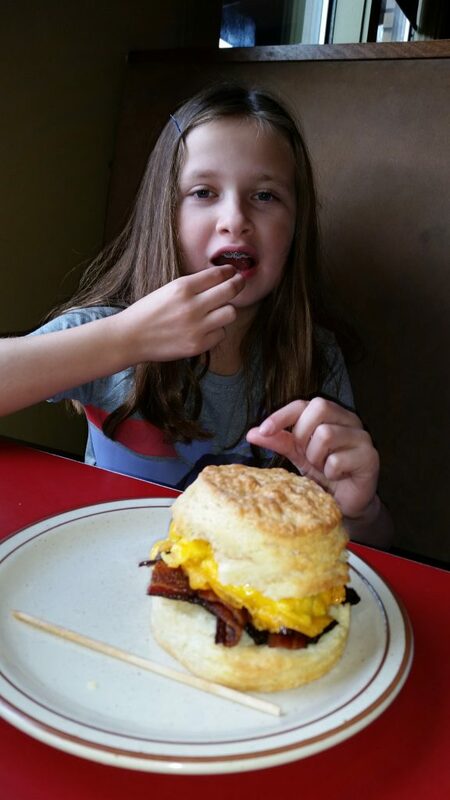 After seeing the Denver Biscuit Company on an episode of Diners, Drive-Ins and Dives, I knew we had to eat breakfast there. This restaurant location is unique in that it serves breakfast and lunch during the day under the Denver Biscuit Company name, and then changes over to a pizza restaurant called Fat Sully’s at dinner time. Plus, it’s a bar called The Atomic Cowboy. So be prepared for a bit of confusion once your kids start asking why you are taking them to a bar at 9 am. Now for the main attraction, the biscuits! The gigantic biscuits were so light and buttery! We sampled the biscuits and gravy, biscuit french toast, and a biscuit breakfast sandwich with egg, bacon and cheese. In the mood for a biscuit sandwich with sausage, fried egg, apple butter and maple syrup? Try the Dahlia. Does a biscuit sandwich with buttermilk fried chicken, bacon, cheddar, lettuce, tomato and chipotle ranch sound like the perfect lunch? Try the DBC Club. Every plate of food coming out of their kitchen looked so good! After our huge breakfast, we had a fairly short walk through City Park to get to the Denver Museum of Nature and Science and the Denver Zoo. We walked by this cute breakfast spot, and read their yummy sounding specials a couple of days in a row before we stopped in for a meal. The downtown location of The Delectable Egg, was right by our hotel and there are four other locations in the surrounding area. They serve a lot of the standard breakfast items you’d expect, but then there were some items that had a bit of a twist. Since I like to try new food while traveling, I ordered the peanut butter crunch french toast. This was french toast topped with peanut butter and dipped in corn flakes. Add some syrup, and you have a sweet-creamy-crunchy breakfast that tastes like dessert! They have a little bit of everything on their menu, and try to use local ingredients. There is a variety of omelettes, frittatas, pancakes, crepes, benny’s, and skillet meals. 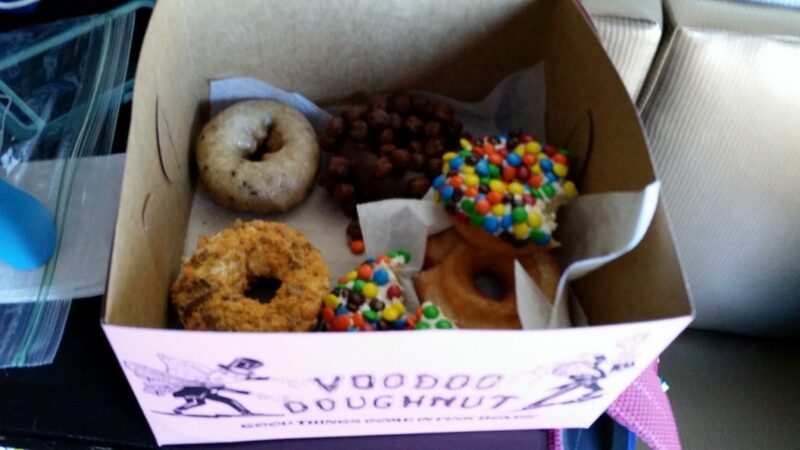 A few years ago, I saw a show about the Voodoo Donuts located in Portland, OR. Those donuts looked so crazy and good! Shortly before our trip, I stumbled across the fact that they have a new location in Denver. Perfect! I went to the website and checked out the donuts. Uh-oh, some were not appropriate for the kids to see. How can they get away with that? That didn’t stop me from walking in their front door, I was just praying they were out of certain donuts. Whew! Nothing obscene in sight! The donuts we sampled were blueberry cake, Butterfinger, M&M, triple chocolate, and a glazed old fashioned donut. Our half dozen of donuts cost $10 and they only accept cash. While I was on Google Maps, I discovered D Bar. I don’t think I was looking for a “bar” when I clicked on it, but I was surprised when the description said “decadent sweets”! I went right to their website and couldn’t believe the sweet treats that I was reading about. We. Had. To. Go. There. 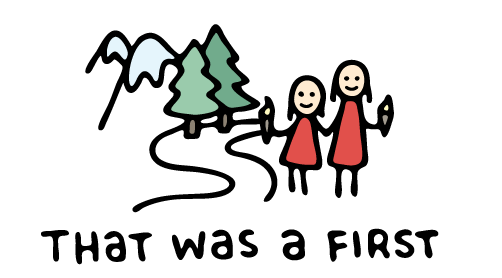 And, we did! We went there our first night in the city, and I made reservations just to be safe. It was a weeknight, and they were packed. Desserts at D Bar are upscale and trendy, but also fresh, seasonal and reasonably priced. My kids tend to like plain old vanilla or chocolate ice cream for a treat, so the BYO Sundae was perfect for them to share. I was just starting to be more conscious of trying new things, so I ordered A Lil’ Sumpin’ Sweet. 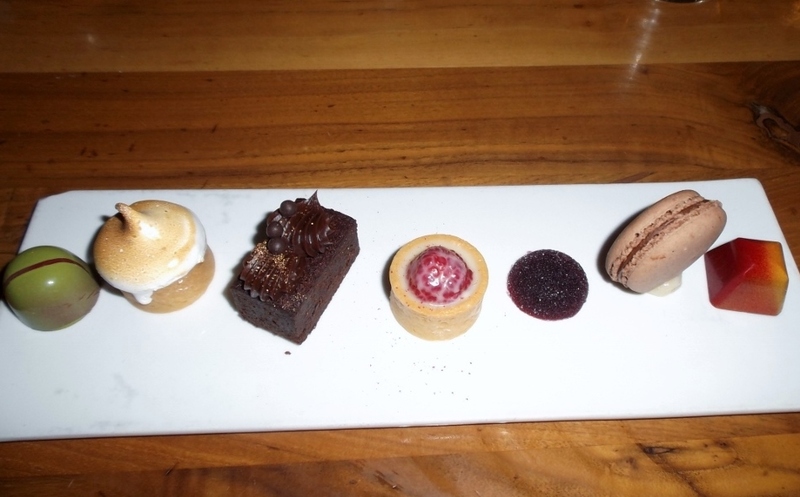 This dessert is a seasonal chef’s selection of individual treats. In other words, I didn’t know what I was getting! That was a first for me! My treats were a variety of flavors from chocolate, to key lime, to peanut butter and jelly. All were perfect! My mom ordered the Molten Cake Thingy That Everyone Has (their words, not mine). It was super fancy and did not disappoint! Our total bill for the three desserts was $36. People kept telling us that we had to go to Casa Bonita. So we did. Now I don’t need to go ever again. It was an experience that’s for sure. Casa Bonita is part Mexican restaurant, part cliff diving show, and part one of the craziest restaurants you’ll ever visit. It’s 4 1/2 miles from downtown, but close to a light rail stop. We chose to use Uber. Our Uber driver told us that we wanted to be finished with our visit there before it got dark outside. Uh-oh! He quickly reassured us that we would be fine, and should have fun and experience Casa Bonita. We were there mid afternoon, and there was actually a line to place our order. You order and pay at a counter, and then pick up your meal on the way to your table. You literally have your meal within two minutes of paying. The Mexican food was decent at best. I had a huge portion of nachos. The prices were a little high, but that is for the experience too. There weren’t any smaller/cheaper meals on the menu. Kids choices were the usual. Your meal comes with warm sopapillas and honey that were very a nice treat. Casa Bonita really is quite unique, and a place to bring your kids at least once. The dive show took place three times while we were there, and luckily we were seated by the pool. There is other entertainment throughout the day, so check out the schedule on their website. Casa Bonita also has a game room, which you can conveniently buy tokens for as you pay for your meal. There were two rooms for this and they were small, crowded, and loud. You earn tickets for prizes as you play, and that makes your kid want to stay there for hours. I guess that if someone told me they were visiting Denver, I would tell them to check out Casa Bonita too. We did something different on this vacation and attended a cooking class. This was a fun experience for my kids, mom and me. 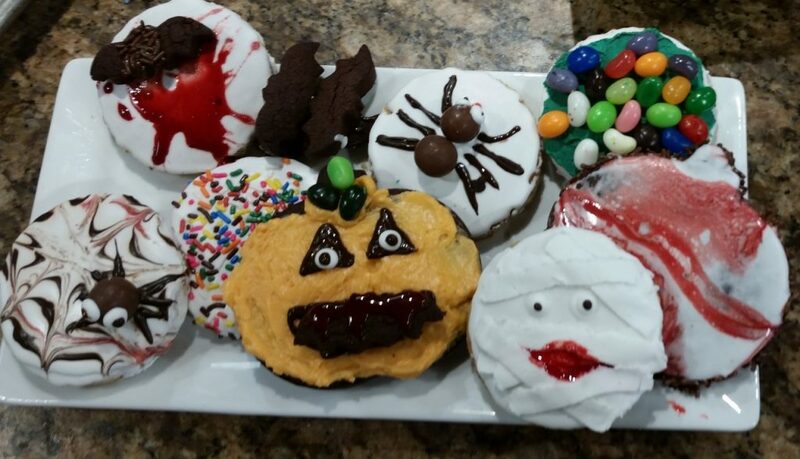 We attended the Cook Street School of Culinary Arts for a kids cooking class and decorated Halloween cookies. Before class started, they served us a light breakfast of yogurt, fruit and homemade granola. After class, we ate a lunch of sauteed chicken breast with a salad. Plus, we walked out of there with a box of decorated cookies for each kid. Since class didn’t start until 11:00, we were able to enjoy a lazy morning. After a light breakfast at the hotel, we made a visit to the Tattered Cover Bookstore. The bookstore is huge, and a perfect place to spend some time on a quiet morning. The Tattered Cover sells both used and new books, so you may just find a bargain. We visited the 16th street location, and they also have 3 other stores. Once my 11 year old found out we were staying close to a Hard Rock Cafe, she really wanted to eat lunch there. Hard Rock Cafe’s are always fun and our meal was fairly good. One evening we were out doing some shopping and suddenly around a corner, a Krispy Kreme appeared! Yummy! This was a first for the kids, and they loved the soft and extra sugary donuts. One fast food place that we have never eaten at is Noodles & Company. I don’t know why…I guess I thought they only served Asian noodle dishes. We now have a new favorite fast food restaurant! On the first night we were in the city, we needed a quick meal before our D Bar reservation. My mom and I like pizza at Grimaldi’s and I knew the kids would like the brick-oven flavor. My kids really ate up the pizza, but the best part for them was grossing me and my mom out by eating the raw dough they were given. Eww! 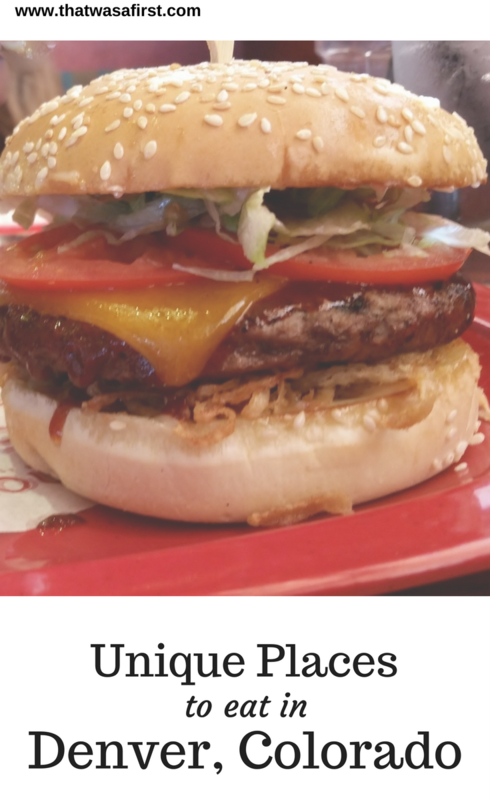 One restaurant we didn’t have time for was 5280 Burger Bar. We did get dessert one night at 5280 Ice Cream, which is right next door. The ice cream was creamy and loaded with flavor. A single scoop of ice cream cost about $3. The food we eat while traveling is always a big part of our vacation. We are more likely to try something new, experience some fun restaurants, and always talk about the food long after vacation is over. I know we missed a lot of outstanding Denver restaurants, and also the food trucks! What are your favorites and where should we go next time? Let me know, I can’t wait!